Darwin is in an area commonly referred to as the Eastern Sierra because it is on the east side of the Sierra Nevada Mountain Range. 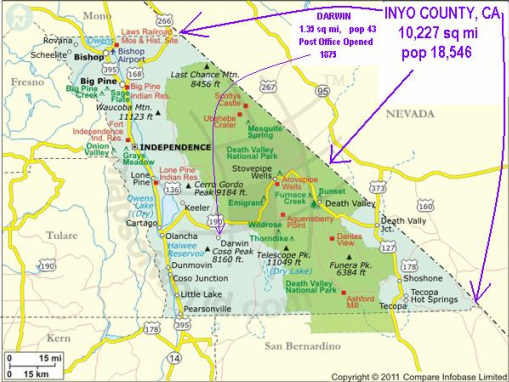 The western border of Inyo County is the crest of the Sierra. The area is famous for its natural beauty and outdoor recreation. The highest point in the lower 48, Mount Whitney, and the lowest place in the U. S., Badwater, Death Valley, are both in Inyo County, and both are visible from Telescope Peak in the Panamint Range. The picture above shows Owens Valley and the Eastern Slope of the Sierra from Tinnemaha Reservoir south. Travel to the west is blocked by the Sierra. The shortest route over the mountains is Route 178, which is just south of Inyo County. What else is in Inyo County?